From pink slips to photos of your ex, bring it and destroy it – cleansing! 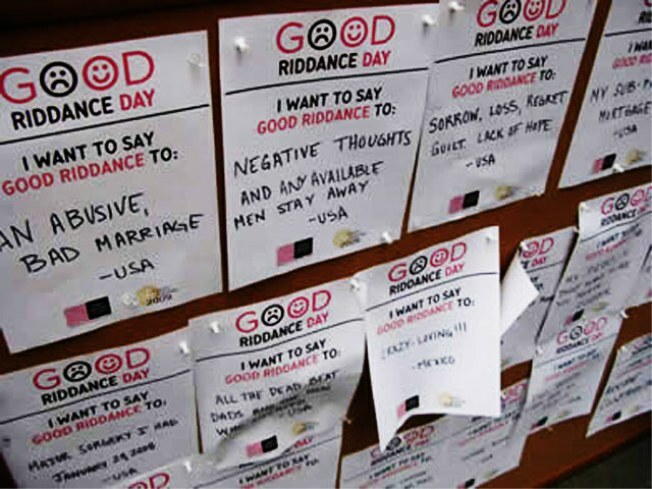 The Times Square Alliance understands the cathartic, cleansing power of deep-sixing that which carries bad mojo, and they’ve organized a special event where New Yorkers can gather and ditch the old before ushering in the new: The Third Annual Good Riddance Day. Today in Times Square, bring it all: Photos of your ex (taken on that trip to Seattle when you thought you were happy but he was schtupping the barista behind your back), your “separation letter” from your employer, the iPod you tried to get repaired seven times – you name it -- and prepare to shred, flatten, decimate and otherwise destroy it all. Shredders and sledgehammers will be provided, along with a dumpster to house it all when you’re through. And the most creative entry even nets $250.